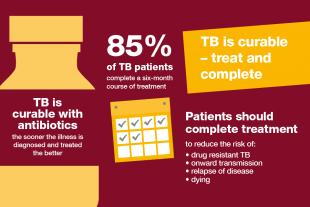 Reducing drug-resistant tuberculosis (TB) in England is a key ‘area for action’ in the collaborative TB Strategy, and Public Health England and NHS England are working together to take this forward. Prompt identification, commencement of treatment and adherence to a full course of treatment for all those individuals with TB is critical to successful cure and preventing drug resistance. The six-month standard anti-TB treatment for individuals diagnosed with drug sensitive TB of isoniazid, rifampicin, pyrazinamide and ethambutol for two months (intensive phase).Treatment is then reduced to isoniazid and rifampicin for a further four months (continuation phase). TB must be treated in combination form to prevent the development of resistance; a very effective regimen. We have seen an overall reduction in TB cases in England, also a decline in new multi drug resistant-TB (MDR-TB) cases; however, TB disproportionately affects people in under-served populations. The number of cases with social risk factors, such as homelessness, drug or alcohol misuse and imprisonment, hasn’t declined. In fact, TB cases with at least one of these risk factors have increased. The risk of MDR-TB is increased in individuals with a history of receiving previous treatment for the disease; in individuals travelling from countries with a high incidence of primary MDR-TB and in those who have one or more social risk factors such as homelessness, problem drug use, alcohol misuse, imprisonment, all of which are associated with a high risk of non-completion of treatment. 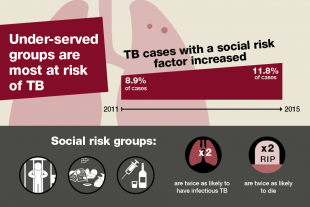 Often a number of risk factors co-exist; and furthermore, TB cases with these social risk factors are more likely to have infectious pulmonary disease. Treatment for MDR-TB is for a period of 20 months with a combination of five or more anti-TB drugs to which the strain of TB is sensitive. The cost of treatment is ten times that of fully-sensitive TB, but more importantly, the drugs used to treat MDR-TB can be very challenging for individuals to tolerate due to their potentially serious side effects and regular monitoring for adverse effects is a standard requirement. The cure rate is for MDR-TB is only 50 percent globally, while the vast majority of drug-sensitive TB is curable. Extensively drug resistant-TB (XDR-TB) can be a result of MDR-TB treatment failure. Treatment for XDR-TB is even lengthier - even more complex - even more expensive and even more challenging for patients to tolerate. The development of drug resistant-TB can become a real issue when treatment is prescribed incorrectly and/or TB cases are not managed in accordance with current guidance: or when the appropriate level of case management has not been applied in relation to the individual’s non-adherence risk assessment to ensure treatment completion and not having a high clinical suspicion of MDR-TB in cases who are from countries with high incidence of MDR-TB. So what can we improve on? Directly Observed Treatment (DOT) together with Enhanced Case Management (ECM) is recommended as a way of supporting not only MDR-TB cases but all TB cases to address clinical and social complexities. This includes acknowledging cultural and other belief systems of individuals. This is why the delivery of care must be person-centered and delivered by the right people with the right skills and in the right place to bring about the desired outcome, not only for the individual but also on a community and population level. 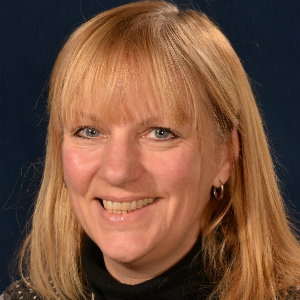 This means that with some individuals it will be necessary to involve a wider workforce to ensure that those individuals receive holistic health and social care packages which are tailored to their needs. Prompt identification of the disease and initiation of treatment to completion for all TB cases to prevent drug resistance and as well as preventing on-going transmission is a must. Acquiring an infection with MDR/XDR-TB is so much more serious than infection with a drug sensitive TB strain, not because it is more infectious than drug sensitive TB, but because of the serious consequences of the sheer complexities in treating, managing, tolerating treatment and treatment efficacy associated with MDR/XDR-TB. Helping to bring down the TB incidence in England is everyone’s business, I encourage you to visit Public health England’s Health matters: reducing the burden of tuberculosis which outlines further key TB statistics, links to a wide range of resources for a wide range of professionals, and also some of the actions that can be taken to further reduce TB incidence and health inequalities associated with TB.